According to experts investigating the frozen continent, the landscape that lies hidden beneath thick layers of ice was carved out by water in the distant past. Researchers suggest that the landscape is in fact so ancient, that it probably existed before the Antarctic ice sheet covered the area. According to a new study on Antarctica, there is a vast canyon system that lies beneath the ice present in East Antarctica. When researchers confirm this discovery, the frozen abyss will become the longest on earth, snatching the number one spot off of Greenland’s Grand Canyon discovered in 2013. This natural wonder – located in the so-called Princess Elizabeth Land, one of the unexplored ‘Poles of ignorance’– was detected through satellite images obtained by scientists from the University of Durham. The team of researchers used a data obtained from radio-echo sounding data whereby radio waves are sent through the ice to map the shape of the rock beneath it. What is, even more, exciting, according to researchers is the fact that this humongous canyon system may turn out to be connected to a previously undiscovered subglacial lake. According to data obtained, this lake could cover a staggering 1,250 square kilometers. What else lies Hidden beneath the Ice? As you are reading this article an airborne survey which is taking measurements of the whole buried landscape is being conducted. Its goal is simple; confirm the existence and size of the canyon system and the lake system, with results expected to be released later this year. Lead researcher, Dr. Stewart Jamieson, from Durham University, said: “Our analysis provides the first evidence that a huge canyon and a possible lake are present beneath the ice in Princess Elizabeth Land. It’s astonishing to think that such large features could have avoided detection for so long. “Our identification of this landscape has only been possible through the recent acquisition, compilation and open availability of satellite data by many different organizations (e.g. 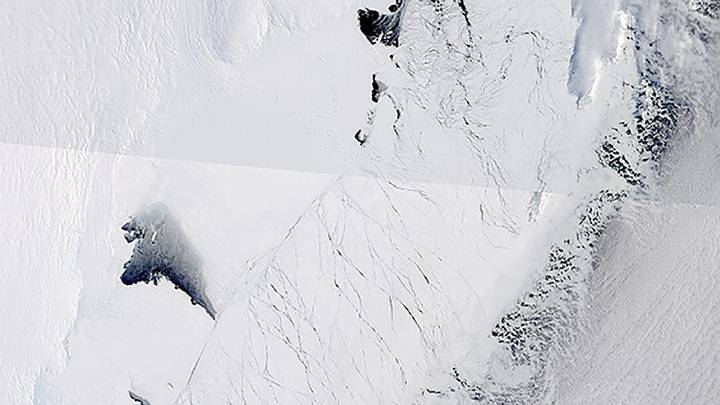 NASA, ESA and the US National Snow and Ice Data Center), to whom we are very grateful, and because of some serendipitous reconnaissance radio-echo sounding data acquired over the canyons by the ICECAP project during past Antarctic field seasons,” Dr Ross said. So how was Antarctica in the distant past? According to research, Antarctica was not always cold, dry, and covered in ice sheets. Au contraire, during its long history, Antarctica was located farther north and experienced a tropical or temperate climate, meaning that it was covered in forests, and inhabited by various ancient life forms. What does this mean? Well… given the little we know about the life on our planet in the distant past, it is likely that people might have lived on this now, icy continent and developed as a society just like people did in Africa, Europe, and Asia. According to creation.com, the Northern Hemisphere Arctic lands are well-known for their warm-climate fossil plants and animals from the Mesozoic and early Cenozoic of the uniformitarian geological column. Today, Antarctica is composed of around ninety-eight percent ice which is over a kilometer thick. So imagine, if, in the distant past, ancient people inhabited Antarctica when it was covered with vegetation and forests, all of their “heritage” is now buried under a thick layer of ice. Even though it is uninhabitable today and only scientists venture out to Antarctica, in the distant past it might have been the perfect place for an ancient civilization to develop. Who knows, after all, it might be very likely that a prehistoric civilization somehow developed on Antarctica and that all the stories of structures and pyramids there are something more than just a myth.